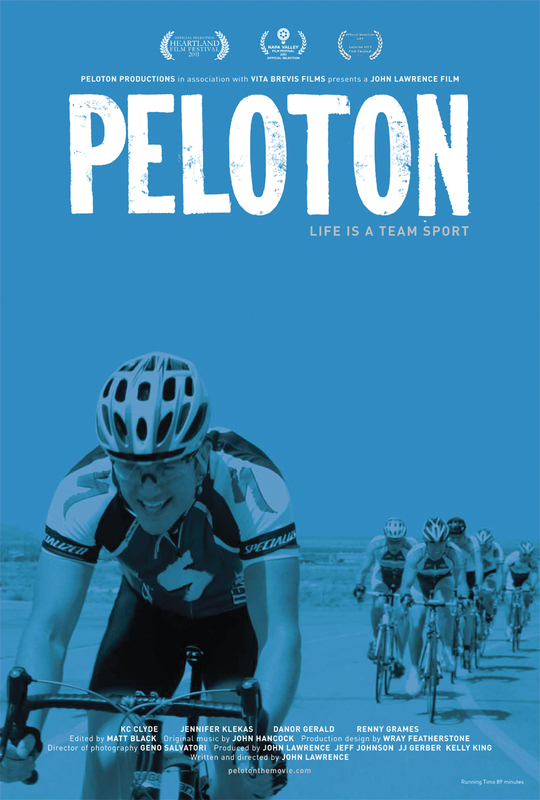 The film Peloton had a special screening in Park City in January. It was the passion project of writer/director John Lawrence who has succeeded in bringing to life this story of a man who finds redemption through the sport of cycling. This inspiring film grabs you with its visually artistic opening sequence of cyclists just flying down a hill. The stunning cinematography by Geno Salvatori brings the story alive and is aided by the film’s soundtrack which pulls the viewer into the film’s story within the first few minutes. Making a film about cycling has its challenges. An avid cyclist, Lawrence had “grand aspirations” of capturing and filming more cycling footage, but the film’s budget established some limits. Another challenge was putting non-cyclist actors on bikes and getting them to the point where they could do realistic bike racing scenes. Chris MacKay was brought in to help the actors learn the necessary skills such as riding in a pace line and clipping in. The actors were willing to take on the physical challenges and kept on riding in the August heat through take after take. Extras weren’t used to step in for the main actors’ most physically demanding scenes, although there were some nervous moments during the filming of the high-speed downhill race segments. In the end, the only cycling mishap happened when an actor pulled into a parking lot and forgot to clip out. It took several years of persistence to bring a film such as Peloton to the screen. A few friends in other states had tried to entice Lawrence to film in their states, but in the end, filming in Utah was a perfect fit. Utah had the ready-made support and connections, not to mention the beautiful scenery. The film certainly received strong local support and one of those early and enthusiastic supporters was Terry McGinnis, the executive director of Tour of Utah. When they first discussed the making of the film, Lawrence was unaware that McGinnis was waging a private battle against cancer. Ironically, it was during one memorable ride when he finally learned that McGinnis was seriously ill, and made a solemn pledge to go through with the making of the film, even if it meant that he had to dip into his retirement savings to do so. He wanted to dedicate his efforts and the film to all those who, like Terry, had believed in him and were stepping into help. Local support for the film didn’t stop there. Karen Weiss, who had stepped in as executive director of the Tour of Utah after McGinnis’ death, gave the filmmakers liberal access to film on site of the 2010 race. Local bike shops such as Contender and Cole Sport lent their support as well. And they weren’t the only locals. Much of the film’s crew and the entire cast came from Utah. The film easily qualified for a new incentive fund from the Utah Film Commission which had been set up to keep local filmmakers in Utah and were awarded UFC’s first such grant. Peloton tells the story of Phillipe Nash, a bike messenger, who longs to race bikes, but lacks the commitment and dedication that cycling requires. In one day, a series of bad decisions leads to him losing his job and his apartment and having an unexpected and embarrassing confrontation with his ex-girlfriend, Kate. Nash turns to his childhood friend Jack, who takes him in and helps turn him around. Jack and Kate challenge Nash to commit to bike racing, which begins to have a positive effect on his life. Just as Nash begins to pull his life together, a tragic event shakes him to the core and he runs away from everyone to retreat into the desert country near Moab. While there, he has an unexpected meeting with some tourists and they help him to understand what is really important in life and help him find the strength to go back. Nash returns, determined to race with his team, and win back the woman he loves. The film was shot over a three week period mostly in the Salt Lake area with one day in Park City during July and August of 2010. Filming continued for three additional days in the Moab area later that season. Local viewers and cyclists will find that part of the fun in watching Peloton is looking out for the easily recognizable locales around Salt Lake City and the surrounding area including some iconic road cycling routes. Even if you had no part in the filming of the movie, the local pride will be felt as you watch this film. The actors, all locals, also do a great job of bringing this engaging story to life. The film also does a good job of capturing the excitement and feel of amateur bike racing and the training that goes into it. Avid cyclists can note some beautiful moments captured in this film: those sublime rides on a perfect day, the close camaraderie of a cycling group or team, the moments where the hard work pays off. In essence it will bring to mind why we love to ride…. Peloton has had only a limited release and has been screened at 3 film festivals and counting. But look for a special screening in Salt Lake in May or June. 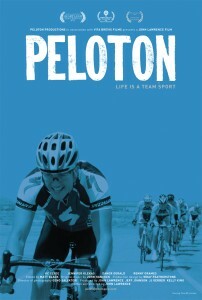 For more information on the film, visit pelotonthemovie.com.